There are many incredible beaches, romantic getaways, day trips, amusement parks, wedding venues, water parks, waterfalls and Georgia vacations just a few hours from Atlanta, GA. Escape to the scenic Blue Ridge Mountains in Georgia in the spring or fall for a weekend filled with fresh mountain air and spectacular views. 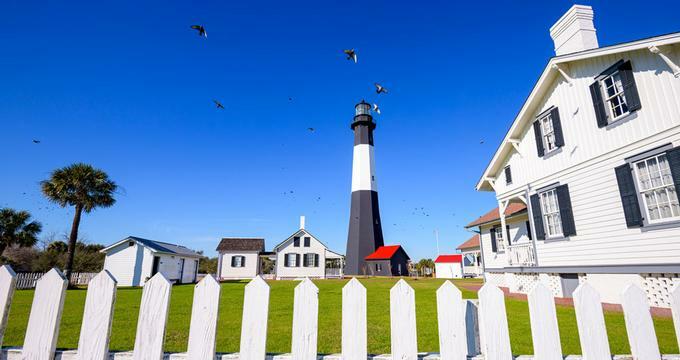 If you are looking for last minute weekend getaways from Atlanta, relax on the sandy beaches of Tybee Island or get away to Augusta or Savannah. Chateau Elan Winery and Resort is one of the best romantic getaways in Georgia, surrounded by wine country views and offering 275 rooms, suites and villas. Guest room decor at The Chateau Elan Inn is inspired by French country estates with embroidered linens, dark walnut woods, an oversized tub, and access to the pool. The winery features special events, cooking classes, cooking demonstrations, and a wine market. The spa includes 14 overnight guest suites which have been recently renovated as well as its own kitchen for complete pampering and relaxation. Couples can play golf on 63 scenic holes and take lessons at the Golf Club. If you are looking for unique Georgia vacations, this is a great place to visit. Rooms start at $199 per night, but ask about last minute specials. Azalea Inn & Villas in Savannah, Georgia is a historic getaway with a romantic garden, outdoor pool and 10 guest rooms, some with fireplaces, private porches and jetted tubs. Luxury touches include nightly wine and hors d'oeuvres (except Sunday), fresh-baked dessert available throughout the day and complimentary wireless Internet. Forsyth Park, Savannah shops and restaurants are just steps from the inn. Plan a weekend trip to the university town of thens, Georgia to enjoy the city’s youthful vibe, art, outdoor cafes, restaurants, theater and football. Hotel Indigo Athens is an environmentally-friendly hotel with a residential feel. Guest rooms and suites feature hardwood floors, expansive windows, high ceilings, plush bedding, and dual shower heads. Suites and the Penthouse have spacious bathroom, a full bar, and amazing views of downtown. The Mansion on Forsyth Park, a Kessler Collection hotel, is situated in a Victorian Romanesque mansion with 125 guest accommodations and The Grand Bohemian Gallery which houses over 400 original pieces of art. 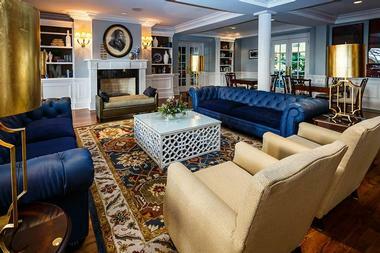 If you are looking for great vacation getaways in Savannah, check into this unique hotel. Guest rooms feature modern luxuries combined with lush fabrics and custom furniture. Enjoy musical performances on the classical grand Bosendorfer piano, listen to gypsy jazz in Casimir’s Lounge, take a cooking class at 700 Kitchen Cooking School, and relax at Poseidon Spa. 700 Drayton Restaurant features fresh culinary delights and an extensive wine list. Forsyth Park Cafe offers views of the cast-iron fountain and serves a light breakfast or lunch. Casimir’s Lounge and Bosendorfer Lounge both offer cocktails and entertainment. If you are looking for Georgia getaways for couples, Mansion on Forsyth Park is a great place to stay with rooms starting at $205 per night. The Lodge and Spa at Callaway Gardens is surrounded by 6,000 acres of forest, flora, and vegetation with luxury amenities in the rooms. The resort offers a choice of 141 guest rooms and 8 suites, all with complimentary internet access, free valet parking, and 310-thread count premium sheets. Guests can take advantage of the outdoor pool next to the hot tub, the Summer Cabana Bar, and exercise in the fitness center. The 13,000-square-foot Spa Prunifolia is surrounded by the flowers that give it its name, and features 13 treatment rooms, lounges, saunas, and steam rooms. There are massages, salon services, couples massage, facials, and body treatments. The Ironwood Lounge and Bar has a large stone fireplace and serves delicious pub-style fare, including rich desserts perfect for a romantic celebration. The Piedmont Grille is the place to go for fine dining, serving healthy and upscale versions of classic southern dishes, and a seafood buffet on Friday nights. Those looking for last minute weekend getaways from Atlanta should check for deals and specials. Rooms start at $149 per night. Vacation ideas and cheap weekend getaways in Georgia: 23 Best Things to Do in Atlanta. Cedar House Inn & Yurts is one of the top green getaways from Atlanta, GA, located in the heart of the North Georgia wine country, just minutes from the Appalachian Trail. Couples can choose from three rooms and two eco-friendly yurts. The property caters only to adults which makes it perfect for a quiet retreat in the country. Rooms at the Cedar House Inn start at $115. The recently renovated Partridge Inn Augusta has a long history - it was first converted into a hotel in 1892. The property offers five different types of rooms, all of which feature period-style furnishings, high-speed internet, and a stylish sitting area. Ask for one of the balcony rooms on your romantic getaway. Guests have access to a secluded outdoor pool and dining on the verandah. The P.I. Bar and Grill has hosted presidential banquets and serves modern Southern cuisine, including a delicious Sunday brunch. Sip a cocktail, enjoy wine specials on Wednesdays, and listen to live jazz music on Friday and Saturday nights, without a cover charge. Rooms at The Partridge Inn start at $139 per night. 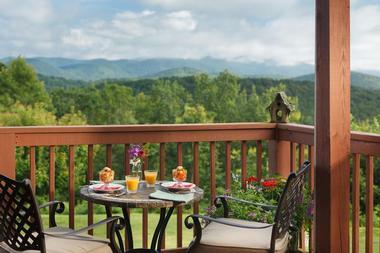 If you are looking for romantic getaways in GA, the Partridge Inn is a great option. Jekyll Island Club Hotel is a relaxing resort set on a scenic barrier island in Georgia. This is a getaway where parents can enjoy romantic moments together while children participate in fun activities. If you are planning a summer trip, children ages five to twelve get access to the Club Juniors summer program which will take them on unique adventures such as a dolphins cruise. Summer Waves Water Park, open from Memorial Day to Labor Day, offers slides and waterfalls, available to kids under 48" tall. The Cloister at Sea Island is one of the most spectacular beach getaways and driving vacations in Georgia, featuring five miles of private beaches, stunning golf courses, and elegant accommodations. The main building features several types of rooms and suites, all with unique designs, wood furnishings, handmade Turkish rugs, deep-soaking tubs, and modern amenities. The Lodge offers 40 additional guest rooms with expansive ocean views and butler service. The resort is home to Wonderland - a candy and ice cream shop, a movie theater that seats 100, a coffee stand, tennis courts, and the three 18-hole championship golf courses. The Spa and Fitness Center measures 65,000 square feet in size and includes indoor pools, yoga, cycling classes, and personal training. 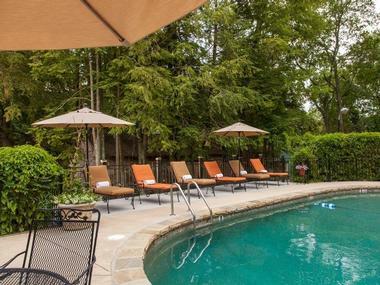 Camp Cloister can keep your children entertained while you relax in the spa. There are many outdoor activities, including horseback riding, water sports, shooting school, boating, and fishing. There is no shortage of dining options at the Cloister. In addition to in-room dining and Wonderland, guests can buy a snack or fresh bread at the Market, enjoy refined southern dining at the Georgian Room, visit the brasserie-inspired River Bar and savor Italian food at Tavola. You can also order coastal southern dishes at Southern Tide, eat a casual meal on the beach at Flip Flop Bistro, have a steak at Colt & Alison, eat at the Oak Room between rounds of golf, or enjoy the sports pub atmosphere at Davis Love Grill. Sea Island is a 5-hour drive from Atlanta, so consider getting away for a 3-day long weekend. A romantic weekend getaway from Atlanta, Barnsley Resort is an elegant getaway located in the foothills of the Blue Ridge mountains in Georgia. The resort offers 87 guest rooms and suites, gourmet dining and many activities. The resort has a Jim Fazio-designed championship golf course with some of the fastest greens in the Southeast. Guests can take lessons and perfect their game on their weekend trip. In the spring, summer and fall, take a guided tour of the lush hotel gardens where gardeners are hard at work all day long to sculpt a beautiful heirloom garden filled with blooming flowers and lush trees. Another great way to explore the area is to rent a mountain bike or a cruiser. 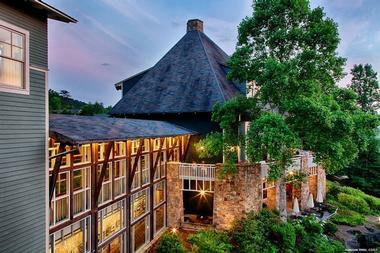 The resort offers tennis, fitness, shooting, 12 miles of scenic hiking trails, lawn games and the Barnsley Museum, making it one of the top active vacations in Georgia. The museum is attached to the historic Ruins and houses Civil War artifacts as well as all artifacts related to the property history. Wolf Cave Mountain Field offers two different paintball fields. One field is in the "woods" and another is in an open field with giant pieces of wood to hide behind. Dining options include The Woodlands Grill, Beer Garden and romantic picnics in the garden. Rates start at $259/night. Olde Harbour Inn is a modern getaway with historic roots. Guests will find cobblestones dating back two centuries in this former bluff-side warehouse, seamlessly mixed together with modern amenities. 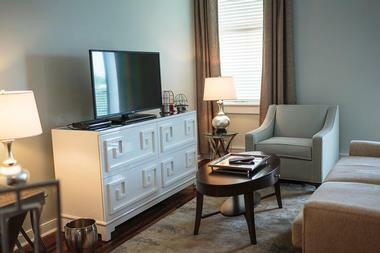 The 24 guest suites offer apartment-style amenities, including a refrigerator, coffee maker, microwave and Wi-Fi. Guests are welcome to bring along their pets. The concierge will help you make dinner reservations or schedule tours around the city. There is a deluxe continental breakfast in the morning, and complimentary wine and hors d’oeuvres in the evening. The nightly turndown service includes ice cream treats. Rooms at The Partridge Inn start at $190 per night. Offering spectacular views of the Blue Ridge Mountains, Lucille's Mountain Top Inn & Spa offers couples elegant rooms, a relaxing spa and access to award-winning wineries in the area. Each morning, wake up to the scents of homemade Strawberry Muffins, fresh baked Cinnamon Bread and Breakfast Pizzas. Spend your weekend getting massages at the day spa, hiking in the Blue Ridge Mountain and exploring the charming Village of Sautee. Other local activities and attractions include scenic waterfalls, the Folk Pottery Museum of Northeast Georgia, Chattahoochee River tours, fly fishing on Soque River, zip lining, golf and hot air balloon rides. Don't miss the sunrise or sunset from Lucille's Crow's Nest which offers a 360-degree view of the mountains and Sautee Valley. Lucille's offers 12 stylish guest rooms and suites, some with fireplaces and Jacuzzi tubs, and all with beautiful Blue Ridge Mountain views. Rooms at Lucille's start at $184 per night. Serenbe is a unique combination of living spaces for visitors and locals alike, divided into four hamlets designed to provide a relaxing, well-balanced weekend in the Georgia countryside. The Inn at Serenbe has 19 guest rooms, surrounded by organic farmland, a seasonal Saturday Farmer’s Market, and commercial centers within each hamlet, offering education, health, agriculture, and arts. Serenbe Playhouse features cultural events year-round, including music, lectures, films, festivals, culinary workshops and art galleries. Weekend activities include trail riding and relaxing treatments at the spa. Blue Eyed Daisy is a delicious bake shop in the community. The Farmhouse at Serenbe was one of the first farm-to-table restaurants in the area and continues its tradition. The Westin Savannah Harbor Golf Resort & Spa is the perfect combination of modern luxury and southern charm, with an excellent location right along the waterfront in the center of the Savannah River District. There are seven types of rooms, all with wireless internet, natural lighting, and gorgeous views of the golf course and the river. Ask for a room with a balcony or a suite with extra space and additional bathrooms. Guests have access to a secluded beach, the Heavenly Spa by Westin and the Westin Workout Fitness Studio. You can rent an ElliptiGO, visit the Road Course, or take advantage of deep water docking options. 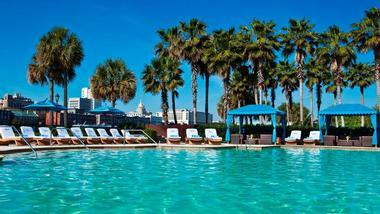 The Westin Savannah Harbor hosts First Friday Oyster Roasts and live concerts. There are many dining options to choose from: Aqua Star has steaks and seafood with gorgeous views. Champions Grill/Legends Bar offers a relaxed atmosphere next to the golf course. Midnight Sun Bourbon and Craft Lounge serves light fare. Escape Pool Bar & Grille has burgers and cocktails as well as occasional live music and Aqua Fuego Champagne & Wine Bar has a hand-picked wine selection. Rooms start at $239 per night. Brasstown Valley Resort & Spa, GA, is a scenic mountain resort with a top-rated 18-hole championship golf course, stables, spa and several exceptional restaurants. The resort features a unique spa suite with a private roof top deck and a Jacuzzi tub for two, perfect for couples. If you are looking for romantic Georgia vacations with many activities, this is a top choice. Rooms start at $139 per night. The Hamilton-Turner Inn, a part of the Southern Living Hotel Collection, offers 17 rooms and suites with rich cotton sheets, custom bedding and flat-screen TVs. Guests have the chance to enjoy a newspaper with their morning coffee in the Parlor and a southern breakfast every morning. Head to the Parlor for refreshments in the afternoon, hors d’oeuvres and wine in the evening, and port in the late evening, or simply wait for bedside sweets during the nightly turndown service. Guests can bring small pets with them for a nominal fee. Simply stepping outside of the inn puts you in the historic district, where you can visit galleries, restaurants and shops. Rooms start at $585 per night. 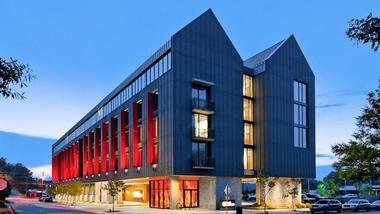 Andaz Savannah has a relaxed urban vibe combined with Southern sophistication. Located just steps from Ellis Square, the hotel features 151 guestrooms and suites with ultra-modern amenities, large windows, fine linens, walk-in showers, complimentary non-alcoholic mini bars, and balconies that overlook the Historic District. Relax on the second floor’s terrace pool, which has a fire pit, intimate seating nooks, cabanas, lounge chairs, and even food and drink service. Or enjoy the 24/7 fitness center with cardio equipment, free weights, and an inspiring view of the city with natural light. 22 Square Restaurant is the farm to fork restaurant within the hotel, offering a community table with seasonal, organic produce and meats from local sources, including breakfast, dinner, and hand-mixed cocktails. The 22 Square Bar serves delicious drinks in a modern, yet rustic environment. The Terrace Bar lets you enjoy signature cocktails next to the pool in addition to local, organic food. Rooms start at $219 per night. 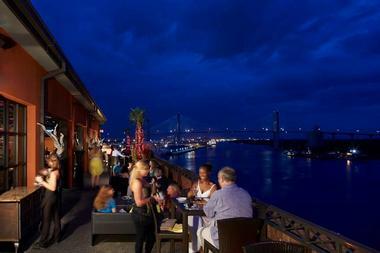 The Bohemian Hotel Savannah Riverfront is designed to take guests back in time to the 18th century. There are four types of rooms to select from, including the choice between a view of the Historic Street or the river. The décor is a combination of vintage and modern styles with large headboards, original artwork, and marble-appointed bathrooms. Rocks on the River features relaxed atmosphere and regionally-inspired food made from fresh ingredients. Rocks on the Roof serves tapas-style food and hand-crafted cocktails. Rooms start at $287 per night. 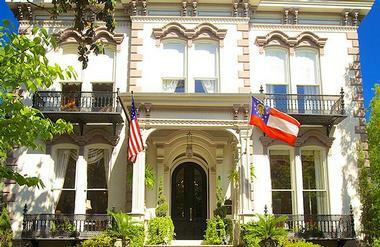 The Gastonian is situated in two mansions which are next to each other and date back to 1868. 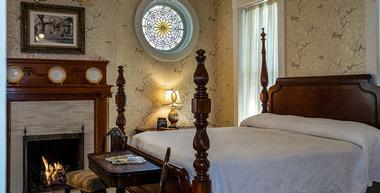 The 17 guest rooms spread throughout the inn have period antique furniture and working fireplaces. Guests receive access to complimentary water bottles, luxury cotton bathrobes, a private bath, and complimentary Wi-Fi. There is a reception with wine and hors d'oeuvres every afternoon, a full daily gourmet breakfast, and evening desserts. The Gastonian is located where Lincoln and Gaston Street connect, offering a central location that is convenient for exploring the city. Rooms start at $233 per night. Chanticleer Inn Bed & Breakfast is located on a scenic plateau that borders Tennessee, Georgia, and Alabama. The property is located 10 minutes from downtown Chattanooga, Tennessee where you will find attractions such as Rock City, the Incline Railway and Ruby Falls. Ask for one of the rooms with a whirlpool tub and a fireplace. 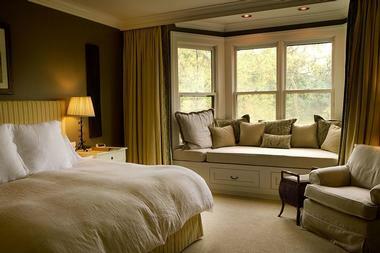 Room rates at the Chanticleer Inn start at $170 per night. The Marshall House offers southern hospitality in the heart of Savannah, along Broughton Street, in a restored 19th century building with floor-to-ceiling windows. There are 68 rooms, including three suites plus 65 gorgeous guest rooms of all sizes. Every guest space has historic touches and modern amenities designed to make you feel at home, including bottled water, a mini-fridge, Wi-Fi, and charging stations in every room. Guests have access to the Wine and Cheese Reception Sunday through Thursday and a deluxe continental breakfast. There is a 24-hour business center with computers and internet access for guests, and optional valet parking. 45 Bistro provides an upscale dining experience in a relaxed atmosphere, complete with a full bar. The hotel is close to the City Market, Lucas Theater and Owens-Thomas House. Rooms start at $161 per night. Augusta is renowned for its Southern charm, which you can experience first-hand at the Savannah Rapids Visitors Center where you’ll get great insider tips from enthusiastic locals on your day trip from Atlanta. The Riverwalk along the Savannah River is a beautiful place to take a stroll, have a picnic and visit the Saturday Market, Japanese Garden and the Morris Museum of Art. With 14 miles of biking and hiking trails, the Phinizy Swamp Nature Park is the perfect place for an outdoor adventure. Sports and music lovers can catch a game or a concert at the Lake Olmsted Stadium, attend a show at the Imperial Theater or take in the beautiful sounds at the renowned Augusta Symphony. Experience the rich cultural and architectural heritage of Augusta by visiting the Gertrude Herbert Institute of Art, Augusta Museum of History, the Sacred Heart Cultural Center and the Downtown Historic District, which dates back to 1801. The Lucy Craft Laney Museum documents the life of Black Americans in the South, while Meadow Garden and Ezekiel Harris House date back to the late 1700’s. If you are looking for two hour trips from Atlanta, Augusta is a great destination to explore. Savannah is a peaceful city full of so much history. To enjoy all the historic and cultural sites the city has to offer, take a narrated tour on the Oglethorpe Trolley which offers 90 minute tours and a hop-on-hop-off service. The Historic District is the place to see many landmarks and examples of Georgian, Gothic and Greek revival architecture. The area is home to the Saturday Farmers Market and Ships of the Sea Maritime Museum. Other historical sites include the Owens-Thomas House and the Juliette Gordon Low Mansion, the birthplace of the founder of the Girl Scouts. Visit the University of Georgia Aquarium which has a touching tank, the Georgia State Railway Museum and the Oatland Island Wildlife Centre. Foodies gravitate to Chef Darins Kitchen for cookery lessons or take to the streets on a Savannah Taste Experience food tour. The Savannah Waterfront lies along the Savannah River and is a lively area well-endowed with galleries, shops and restaurants. You probably need a full day to visit Lookout Mountain, where you can take the Incline Railway to the top for amazing views and the chance to see America’s largest underground waterfall at Ruby Falls. Tour the caverns and try the zip-line adventure. Racoon Mountain Caverns are another great attraction for cavers. Back on the ground you can take a 90 minute Chattanooga Sidewalk tour to get a historic overview of the city attractions. Art lovers should head to Bluff View Art District to visit the Hunter Museum of American Art, while antique hunters will want to explore Knitting Mill Antiques, which features over 100 shops. Make your way to the Creative Discovery and Railroad Museums or Audubon Acres, Maclellan Island, Tennessee Aquarium and the Chattanooga Zoo. Everyone enjoys a Southern Belle Riverboat Cruise and Tennessee Riverpark is popular for walking trails, boating and experiencing Walnut St. Bridge, the longest pedestrian bridge in the world. Don't forget to leave plenty of time to sample Chattanooga's excellent romantic restaurants. Learn how Birmingham rose to prominence as an iron and industrial center at Sloss Furnaces and Vulcan Park, where there is a 56 foot iron statue of the Roman God of Fire, Vulcan. At Barber Civil Rights Institute and the Kelly Ingram Park you can learn about the Civil Rights Movement. For art lovers, there is the Birmingham Museum of Art featuring international collections with an emphasis on Asian Art and the largest collection of Vietnamese ceramics in the world. The Alabama and Virginia Stamford Theaters host Performing Arts, while Rickwood Field is the oldest functioning baseball park in the country. For hiking and biking, head to Red Mountain Park or take a pleasant stroll around Railroad Park. Other fun attractions include the Barber Vintage Motorsport Museum, the Southern Museum of Flight, the McWane Science Center, and the Birmingham Zoo. Stop at one of these eateries for a tasty lunch. A weekend visit to Florence, home of the University of Northern Alabama, provides a tantalizing taste of traditional small-town Southern living. Florence has several interesting historic attractions including the Rosenbaum House, designed by Frank Lloyd Wright and one of the first Usonian houses built prior to WWII, using all natural materials. You can also visit the birthplace of legendary Jazz musician W.C. Handy and the home where Helen Keller was born, as well as Pope’s Tavern, which is a historic inn and stagecoach stop dating from the Civil War. Outdoor activities are many and varied and include Deibert Park for pleasant strolling and a great children’s playground, and McFarland Park for walking and jogging trails, picnics and camping. Children love the splash pad and interactive fountains at River Heritage Park, while keen fishermen descend on Pickwick Lake, rumoured to have the best fishing in the region. In the Downtown Historic District you can admire the architecture and enjoy varied shopping, dining and entertainment. Plan your weekend in Gadsden to include as many great outdoor activities as possible in this scenically beautiful town. Take advantage of great fishing on the Neely Henry Lake, challenging golf at Twin Bridges Golf Course and several good hiking and jogging trails. At Noccalulu Falls Park there is a 90 foot waterfall to admire, a botanical garden, mini-golf and a petting zoo for the children. The James Martin Wildlife Trail Park has a network of trails and boardwalks though a variety of habitats which are home to many wildlife species. For a touch of culture, Mary G. Hardin Center for Cultural Arts hosts a youth orchestra, dance classes and art exhibits. It also the home of Imagination Place, a wonderful children’s museum. The Gadsen Museum of Art is spread over three levels and presents permanent and visiting collections including local history exhibits on the top floor. The whole family will love The Factory, an indoor activity center with innovative games and activities for all ages. If you are looking for day trips from Atlanta, Gadsden is a great destination to explore. Athens is home to the University of Georgia, which dates back to 1785, and the famous Georgia Bulldogs. It is also where legendary bands such as REM and the B 52’s originated. A good place to start exploring this vibrant university town is the Athens Welcome Center which is situated in the Church-Waddel-Brumby House Museum. Here, you can get info on current productions and pick up guides for the many self-guided tours on offer, which include the historic Civil War Heartland Leader Trails and the entertaining Music History Walking Tour. The popular State Botanical Gardens have many trails to explore as well as a Conservatory and a Visitors Centre. If you’re looking for some live entertainment, you can watch a lively performance at the Athens Creative Theater or the Athens Symphony, or catch a basketball game at Classic City, home to the Athens Razors. Victorian Downtown is the place to go for trendy shopping and dining and to sample the many music clubs the town is famous for. Charlotte is packed to the brim with exciting attractions to fill your weekend visit, and a great selection of romantic restaurants. Capitalize on the city’s emphasis on art and culture by visiting the Mint Museum, the Bechtler Museum of Modern Art, featuring works by Matisse, Degas, Warhol and Picasso, and watch a show or symphony at one of the Blumenthal Performing Arts Theaters. The Nascar Hall of Fame thrills everyone with video, graphic, interactive and rotating displays, and the Aviation Museum has no less than 50 aircraft on display. History buffs will enjoy the Charlotte History Museum, situated in a circa 1774 house, and the Levine Museum of the New South. Children are well catered for by the ImaginOn children’s library and theatre and Discovery KIDS, an amazing educational play experience. 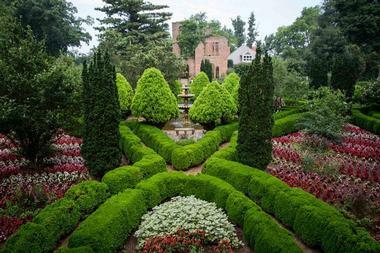 Wing Haven Gardens and the Charlotte Botanical Gardens are sure to please nature lovers while foodies can take a walking food tour to sample local restaurants. More weekend ideas in North Carolina. Myrtle Beach is famous for long, sandy beaches and a massive selection of golf courses, but there are many more attractions to fill your weekend. Stroll along the Boardwalk and ride the 187 foot Skywheel Ferris Wheel, or learn to surf and hire gear at Surf and Paddleboard Company on Ocean Boulevard. Broadway at the Beach offers excellent shopping and dining in the heart of the city and Family Kingdom and Pavilion Park Amusement Parks have thrilling rides for all ages. Backstage Mirror Maze offers a great family adventure using mirrors and lasers to simulate a 1933 bank robbery. Art lovers can visit the F.G. Burroughs - S.B. Chaplin Art Museum which has four collections including interesting maps and prints. Classic automobile fans will enjoy a visit to Wheels of Yesterday where they can admire up to 50 vintage American cars on display. Outdoor enthusiasts can enjoy nature trails, fishing and camping at Myrtle Beach State Park. Greenville has a good mix of museums, art and outdoor fun to occupy every moment of your weekend. Greenville Museum of Art is one of the country’s top venues for American Art and holds important collections of work by Andrew Wyeth and Jasper Johns, among others. The Children’s Museum of the Upstate has outstanding hands-on educational exhibits and the Bob Jones University Museum has a significant collection of religious art. Roper Mountain Science Center includes a planetarium, arboretum and a forest trail where you can picnic and experience Butterfly World. Outdoor activities abound; Falls Park is a pristine oasis in the Historic West End, for walking, picnics and the Swamp Rabbit Trail along the edge of the river. The Greenville Zoo has a large collection of animals, as well as pleasant walking and cycling paths. More weekend ideas in South Carolina.